Located in Santa Barbara, California, this modern guest house was designed in 2017 by Anacapa. Located on one of the last remaining undeveloped coastal areas in California, this modern guest house resides on a wildlife preserve; exemplifying a successful balance of residential development and ecological preservation. Nestled into a steep hillside, the residence was designed with low visual and environmental impact on the surrounding landscape. 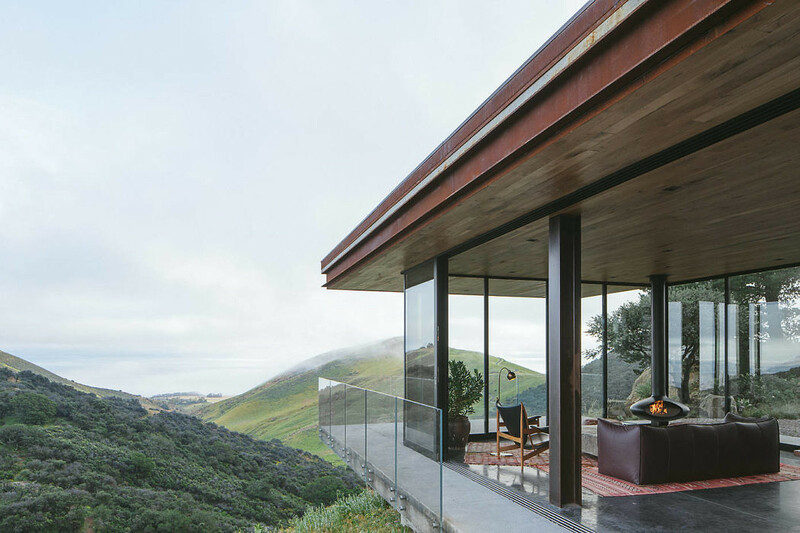 Disguised by a low profile and green roof, the home itself invites sweeping (nearly 360 degree) views of the Pacific Ocean and surrounding rolling hills, through a generous amount of sliding glass and expansive decks, which cantilever over the foundation?s steep rock face. Designed by principal architect Dan Weber of Anacapa & designer Steve Willson of Willson Design, a high level of sensitivity to environmental impacts was exercised throughout all phases of design and construction. The team employed green building practices, resulting in sustainable systems and material selection. The guest house, as well as the owner?s nearby main residence, are completely off-grid out of necessity, there is no electricity available in this remote area. The home is 100% powered by a photovoltaic energy system. LED lighting and low-usage appliances were selected to reduce energy demands and usage.